Poor ventilation is the one thing that can knock the wind out of the sails of your grow operation. It’s been the culprit of many problems in a grow, including the formation of mold and mildew, mites, poor stem development, and generally poor cannabis growth from the lack of proper oxygen/carbon dioxide (CO2) exchange. 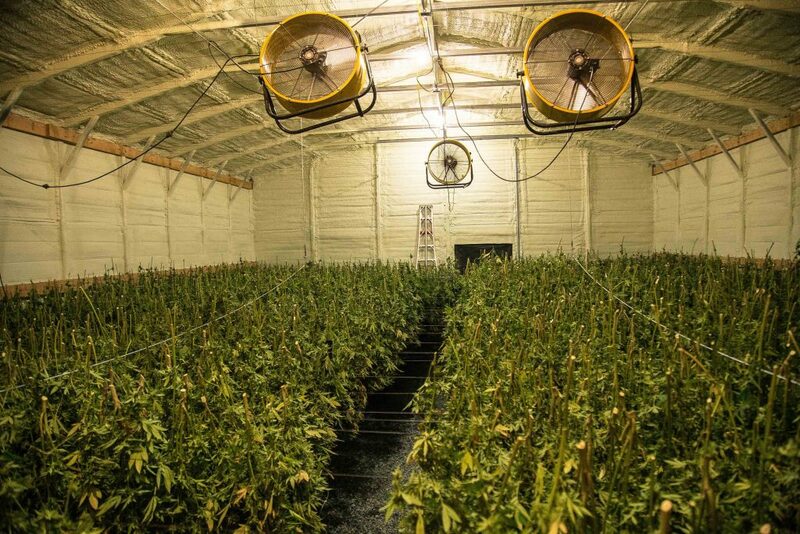 Many growers focus on other aspects of their grow op, including medium selection, lighting and fertilizer, while leaving ventilation to the wind, so to speak. Let’s take a look at the specifics of greenhouse ventilation for large and small cannabis growing operations and why it’s so essential. “Getting it juuuust right” might be a good mantra when it comes to ventilation of a grow room that consists of a grow tent or similar small space. Your precious plants require the proper exchange of oxygen and CO2. 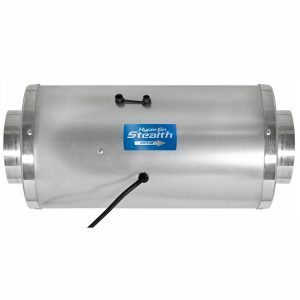 This is provided by some form of exhaust fan that can remove heat and moisture and pull in fresh air and CO2, which is part of the formula, in addition to light, that allows photosynthesis to take place. A grow room consisting of a tent should have a way to ventilate stale air. This normally takes place at the top or ceiling of the room. A six-inch fan mounted to the ceiling is sufficient to draw air out of the top of the room, while sucking fresh air into the grow tent. Fresh air should be drawn in from outside via a window or vent if possible, according to Jorge Cervantes, who literally wrote the book on growing cannabis indoors. In some closets, a ceiling-light fixture may already exist, allowing you to wire the fan into the existing electrical wiring (after cutting a careful hole through the ceiling to mount exhaust duct work). Be sure to shut off the power to the fixture before wiring the fan! It’s perfectly fine to keep the exhaust fan running 24/7 — and there are fan controllers available that turn on when certain temperature and humidity levels are reached. However, this may not take into account the cooler temperatures when the lights are off. The temps may be cooler, but the plants still need fresh air. For that reason, growers may find it best just to leave the fan running around the clock. Air circulation is the other part of the equation regarding ventilation. This will require a little more thought on the part of the budding cannabis grower. The goal of circulation fans should be to provide the minimum amount of air movement required to strengthen the stems of your plants, provide fresh air to the four corners of the room or tent, and to help prevent problems like mold, mildew, mites and even gnats. Providing the minimum amount of air movement will prevent the crops and potting mix from drying out too fast (or unevenly), while ensuring that you’re not using any more energy than is necessary to grow healthy plants. OK, we’re not opening up a storefront here, only emphasizing the importance of properly locating fans for maximum effectiveness and efficiency. One or more fans should be located so as to blow air across the top of the crop canopy, gently rustling the leaves and buds of your rapidly growing ganga. This will help cool the plants from the intense heat of the lights (especially if using high pressure sodium bulbs). Thus, you may want to purchase one of those four- or six-inch clip-on fans and aim it toward the canopy. As an alternative, a floor fan could be used on a low setting. However, a clip-on fan will take up much less of the precious space inherent in a small grow room and provide a gentler breeze to the plants. Place a fan below the canopy as well to help reduce moisture buildup underneath. 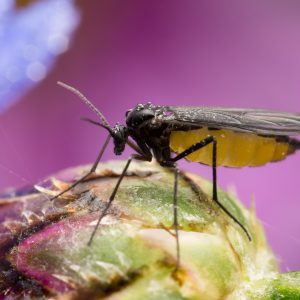 This will also help prevent fungus gnats taking up residence in overly moist potting mix. The trick to proper circulation is providing fresh air to all corners of the room, without blasting plants with air directly in front of the fan/s. Check your thermometer often to see the effect the fans are having at keeping the grow room at the proper temperature. The temperature and humidity outside the room should also be considered. Summer is naturally going to be warmer, causing the room to be a little warmer and perhaps more difficult to keep cooled to the desired temperature range of 65–70 degrees Fahrenheit. Monitor humidity as well, which can vary, depending on the type of heat source you’re using in the winter and the outside environment — that is, if you’re drawing air in from a window in the summer. 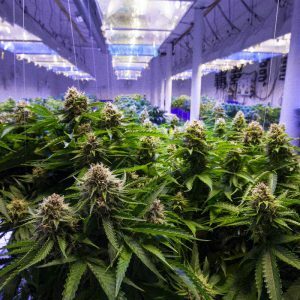 Many growers report that it’s easier to grow inside these rooms in the fall and winter, when temperatures can be more easily controlled (unless you have air conditioning in your home that you can use during the summer months). However, in the winter, the air can be dryer, setting up ideal conditions for mites. Bottom line? Consider all of the variables between summer and winter and plan your ventilation accordingly. Industrial fans in this commercial grow op provide ventilation to circulate air and cool the temperatures. 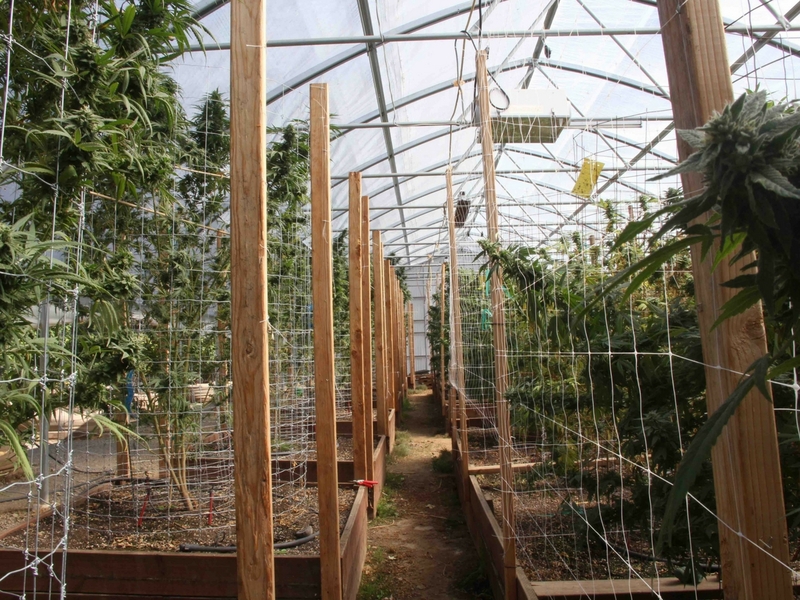 The stakes are a little higher for the commercial cannabis grower when it comes to ventilating a greenhouse, with profit margins narrowing as more and more people get into growing commercially. Thus, every available means of growing a crop with the least amount of inputs is taken into consideration, including the energy required to ventilate a greenhouse. The horizontal air flow (HAF) ventilation system has been a standard in the greenhouse industry for decades. The concept is a simple one: Draw air in one end of the greenhouse and out the other via large fans and mechanized louvers. A lot can be said for this type of ventilation, which provides sufficient cooling, oxygen and CO2 exchange, while helping to strengthen the stems of the plants. However, this system is limited somewhat to the standalone greenhouses (say, 30 feet by 90 feet or smaller), where other structures aren’t butted up against one another (i.e., gutter to gutter and end to end). Here’s how to efficiently and effectively ventilate a greenhouse using the HAF system of ventilation. The typical HAF ventilation system will have (often two) large, preinstalled high-powered fans on one end of the greenhouse on either side of the door, drawing air across the top of the canopy of the plants. Smaller fans are essential and are used to circulate air within the greenhouse in much the same way, but on a larger scale, as do fans in a small grow room and tent. The key to maximizing this type of ventilation system is in choosing the right size of circulating fan and locating it to where it will be of most benefit. Small 1/10- to 1/15-horsepower circulating fans with 12- to 18-inch blades will provide sufficient air movement, while keeping energy costs to a minimum. Experts like John W. Worley, a retired professor from the University of Georgia who has performed numerous energy audits of greenhouses, suggests selecting fans that have a high ventilating efficiency ratio (VER) measured as cubic feet per minute (CFM) of output per watt of electricity input. Fan manufacturers should have that information available for the product. Locate these circulating fans 4–5 feet above the benches so they are in sync with the circular horizontal air mass that is being created by HAF ventilation. Place one fan 10–15 feet from one end wall to go with the flow of the air that is coming around the corner from the other side. Additional fans should be located 40–50 feet apart to keep the air mass moving. Spacing fans too far apart will create a dead space. A smoke bomb or incense stick can be used to find out where your dead spaces are (i.e., where there is no air flow) so that you can adjust the fans accordingly. Worley advises purchasing high-efficiency fans when setting up a new greenhouse to get the maximum efficiency and cost savings. A good source for energy ratings of fans can be found at the University of Illinois’ bess.illinois.edu. “A lot of people new to greenhouse production, whether they come from an indoor facility or a field-grown operation, are unaware of the opportunities with natural ventilation,” says Nadia Sabeh, president and founder of Doctor Greenhouse, a greenhouse design and consulting company based in California. Throughout her career, Sabeh has seen a lot of different grow setups and has offered her expert services to some of the biggest cultivation operations on the West Coast. According to Sabeh, the way you orient your greenhouse to prevailing winds is more important than how it is oriented to the sun. If the prevailing winds are out of the west, then the greenhouse should be installed so that side vents are facing the west. Thermal gradients are created in the greenhouse on sunny days when the air becomes warmer and lighter. To take advantage of natural ventilation, these greenhouses use ridge vents at the top of the structure, which will draw fresh air via the west-facing side vents. The result? A heap of savings when it comes to energy, and an effective way to ventilate your plants. So, whether you’re growing in a 4 X 4 tent or measure your greenhouses in acres, pay attention to how air is being circulated and ventilated. Your plants will thank you and so will your wallet.